The second step in buying a house is determining your budget. This Mortgage Affordability Calculator helps answer the question 'How much mortgage can I qualify for?' and 'How much home can I afford?'. You can use the House Payment Calculator function - calculate for the 'total monthly payment' and it will calculate the maximum home you can purchase with that monthly payment. There's also the Mortgage Qualification Calculator option, calculate for 'Annual Income' and it will provide an approximate purchase price based on industry guidelines. Please note those guidelines can vary based on your credit report, income, and other determining factors. This will also serve as a typical mortgage calculator. 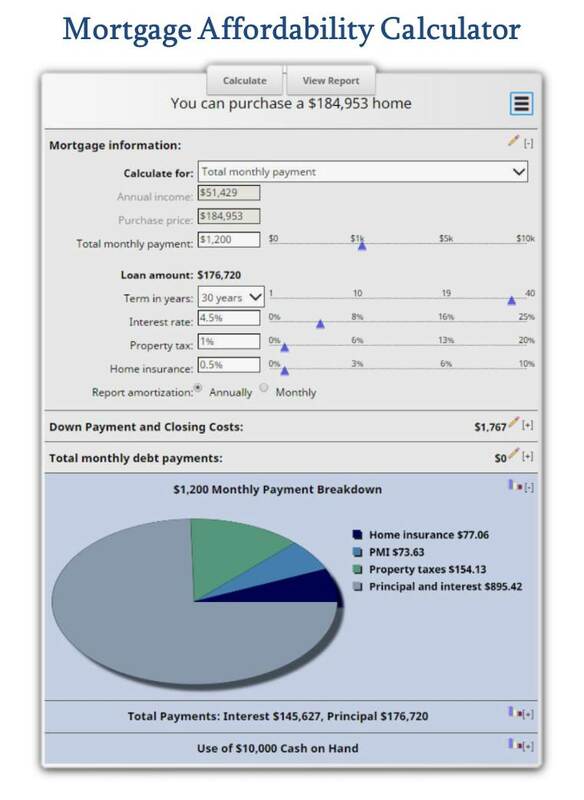 Calculate Mortgage Payment by selecting Calculate for 'Purchase price' on this Mortgage Affordability Calculator. Choose your options below and click on the "View Report" button to see a complete amortization schedule of your mortgage payments. Looking for a different mortgage calculator? Feel free to use current Home Loan Interest Rates in this mortgage calculator. Any Mortgage Affordability Calculator may not provide you with the maximum home price that you can afford. Find out more in our Related Article: 'How Much House Can I Afford? - The Truth"